A leading global coffee shop franchise has begun to apply interactive digital signage to their newly introduced drive-thru service. Two 50 inch screens at the drive-thru's entrance, powered by a single NDiS B336R, display menu items on one screen and order details on the other. On top of the display, a camera is integrated to provide a two-way communication between staff and driver to improve the dining experience. Content is designed and managed by HQ's administrative office and then published to the field via a virtual private network (VPN). The NEXCOM NDiS B336R features an advanced fanless thermal design for fitting in outdoor environments while maximizing the system performance with an Intel® Apollo Lake desktop processor. The fact that the NDiS B336R is capable of rendering multiple high resolution display outputs simultaneously makes it an ideal platform for a variety of QSR applications. The NDiS B336R is perfectly designed for outdoor/ semi-outdoor applications capable of surviving under -20~60℃ and it supports dual HDMI and DP output interfaces, making it a high CP value player in the drive for high quality animation and graphics in drive-thru applications. Due to its ultra slim chassis design (21mm z-height), users can easily find a place to install the NDiS B336R. Installed at the ordering point, the NDiS B336R- powered face-to-face ordering system plays menus and promotions on three large screens. When customers pull up at the ordering point, a barista will show up on the one screen, greeting with a warm smile. Customers can place orders by speaking to the barista face-to-face through video chat and see order details and a total price on the screen so they can rest assured that their orders, especially customized drinks are taken correctly. The order is sent to POS terminal. Customers can make the payment and pick up meals at the next drive-thru window. The coffee chain has successfully launched the drive-thru service with the implementation of the face-to-face ordering system. Taking advantage of NEXCOM digital signage player's high-definition video-streaming capability, multi-display support, and rich I/O set, the system enhances service efficiency and accuracy by facilitating the ordering process, creates a genial drive-thru service for the coffee chain. NEXCOM’s NDiS B series of digital signage players features an advanced fanless design for outdoor environment. 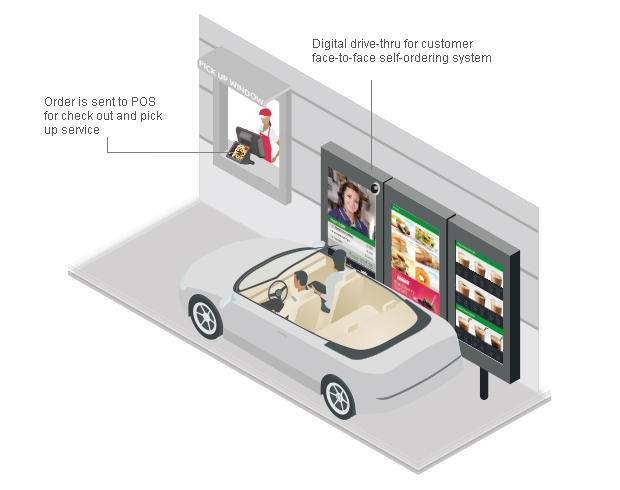 The NDiS B336R, for example, can provide face-to-face ordering at the drive-thru lane. Built with high-definition video-streaming capability, multi-display support, and rich I/O set, the player can facilitate the ordering process to enhance service efficiency and accuracy and create a genial drive-thru service to boost traffic and sales. Orders made at the drive-thru service are sent to POS terminals with a second display to show order details and total amount to ensure order accuracy. The fanless NPT POS terminals have low power consumption and require minimal maintenance. The NPT series comes with a removable HDD, MSR, fingerprint and VFD kit. The NPT series has a small footprint ideal for space-saving installations.